Enjoy another issue of NetEqualizer News! This month, we preview our new NetEqualizer Cloud Reporting feature, show off our new Internet Providers Guide, and highlight one of our international resellers – Reinaldo Neilla. As always, feel free to pass this along to others who might be interested in NetEqualizer News. I must admit that my head has been in the clouds a lot lately, as I like to bird watch, and the spring migrations are in full swing here in Colorado. 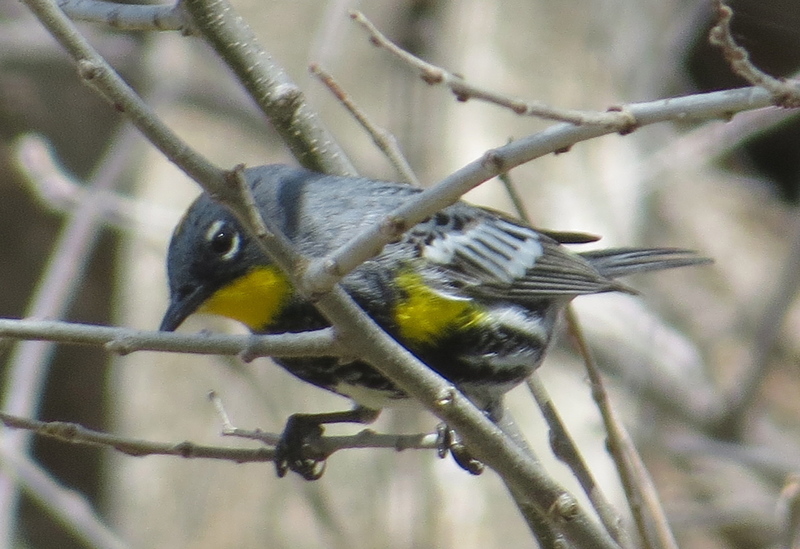 I saw two “life birds” this spring (a life bird is the first time you see a bird in the wild) – the Common Yellowthroat Warbler (not common in my part of Colorado!) and a Lesser Goldfinch (only a tiny slice of its range is in Boulder). I guess staring at all those clouds gave me an idea, which I share with you this month in more detail below. In a nutshell, we can use the cloud to help store longer periods of data for reporting. Read more about our upcoming NetEqualizer Cloud Reporting offering below. We love it when we hear back from you – so if you have a story you would like to share with us of how we have helped you, let us know. Email me directly at art@netequalizer.com. I would love to hear from you! Coming this July, we will offer the ability to store up to one year of reporting data from our Dynamic Real-Time Reports onto a cloud server. The benefits will be numerous, as it will be complete turn key access to historical usage at the touch of button. For example, if you want to know what your usage data looked like for the same month last year, you can pull it up instantly. 1) Your NetEqualizer must have access to the Internet (our cloud server). Retrieval will be as easy as providing a date range, and IP or subnet. In version 1.0, all usage will be IP based. We will also include reports for system protocol usage (Netflix, YouTube, etc.) depending on demand for this information in coming releases. This month we have updated our Internet Providers Guide. If you are a telecommunications, satellite systems, cable, or wireless/wired Internet Services Provider (ISP), and are considering a NetEqualizer, you may want to review our updated Internet Providers Guide. 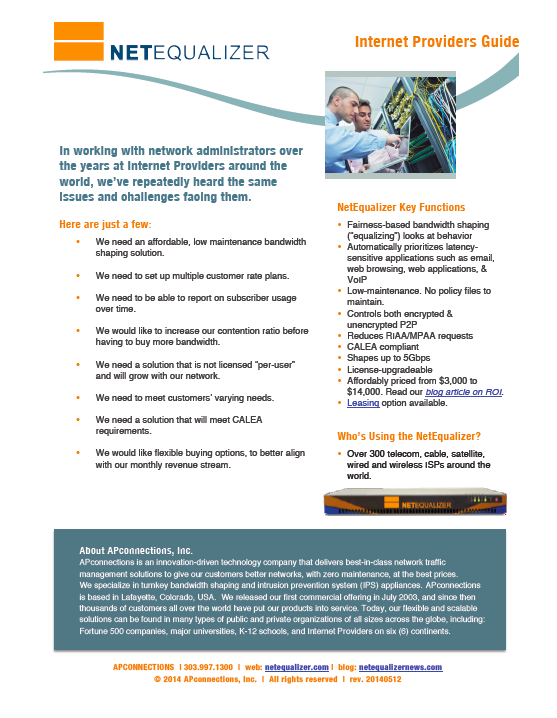 This summary guide (2-3 pages) is focused on issues specific to Internet Providers, and explains how the NetEqualizer is used by our customers to address these common issues. This is a quick way to learn about how the NetEqualizer might apply to your environment. If you are a current customer, these guides are a great read to optimize your NetEqualizer configuration. Take a look to see if there are features that you might not be using and want to take advantage of in your NetEqualizer installation. We would be happy to help you with your configuration. As many of our customers know, we sell directly to businesses in most geographies, particularly the U.S. and Canada. However, in some areas of the world, we work with reseller organizations. Many of these international resellers started as our customers, loved our product, and asked to get involved in building out the marketplace in their country. We find that our international resellers are great at navigating customs requirements, communicating in local languages, and sharing their technical knowledge of the NetEqualizer. 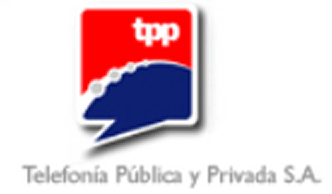 This month we profile one of them, Telefonia Publica y Privada S.A. (TPP S.A.). TPP is an Argentinian WISP with over 30,000 broadband users in different cities in the interior of Argentina (growing at a rate of 450 per month). Reinaldo Neilla of TPP has been using a NetEqualizer for his business since July 2008. We often have networking tutorials in our blog – but not all of them are for enterprise networks. Recently, our Co-Founder, Steve Wagor, wrote a how-to on improving wireless dead spots in your home and setting up wireless home music. Check it out! Why Does Fear Sell over Value for IT? Common Yellowthroats are small songbirds that have olive backs, wings and tails, yellow throats and chests, and white bellies. Adult males have black face masks which stretch from the sides of the neck across the eyes and forehead, which are bordered above with white or gray. Females are similar in appearance, but have paler underparts and lack the black mask. These birds are on the move this time of year through Colorado.